Sutton Coldfield became a self-governing town in 1528 thanks to a Royal Charter granted by King Henry VIII. Instead of a mayor and corporation the charter specified a warden and society - the first wardens were all relatives of Bishop Vesey. On the restoration of King Charles II in 1660 the Warden and Society had to apply for a renewal of the charter, and this was done (for a fee) in 1664. This new charter confirmed the office of Warden, and authorised him to carry a white staff. One of the last wardens before the new charter came into force was Ambrose Cowper, Warden for 1661-2. Ambrose Cowper was a prosperous metal worker, making territs (harness rings) for the saddle-makers of Lichfield; by 1660 he was dealing in property, and set himself up as a yeoman farmer. He aspired to the rank of gentleman, and in 1675, after the death of his first wife, Ellen, he married Mrs. Priest, a gentleman’s widow. He still kept up his ungentlemanly trade in a forge attached to his house at Falcon Lodge - the inventory of his goods made in 1683 includes “in the workshop bellows anvil hammers and iron worth £2. 6s. 8d.” In his will of 1682 he described himself as “Gentleman” even though he had still not learned to write his name. Ambrose Cowper had many children, step-children and grandchildren to provide for in his will, and one of his bequests is to Edward Bennett, husband of his daughter Elizabeth. Bennett was also a yeoman farmer with a big farm of over 100 acres, probably on the Wishaw boundary of Sutton - his goods were valued at £275 on his death in 1692 compared with Ambrose Cowper’s £87. He also made a mark rather than signing his will, but illiteracy did not prevent him from acting as a banker to his neighbours, as his inventory shows that he had lent them over £400. He was Warden in 1675 and again in 1687, but he remained a yeoman, not seeking gentry status - unlike his son Edward Bennett, gentleman, who was warden in 1695 and 1713. 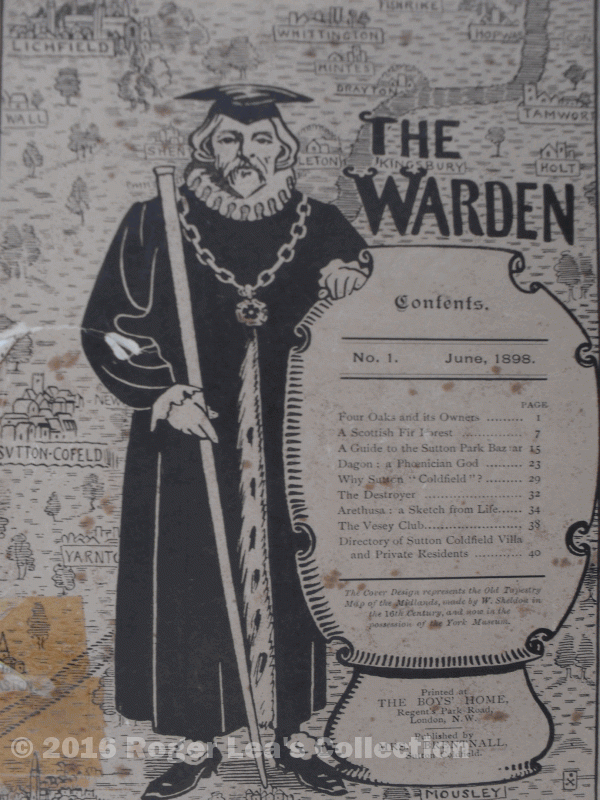 The cover of this short-lived magazine shows a Warden bearing a white staff and wearing a Tudor Rose chain of office.